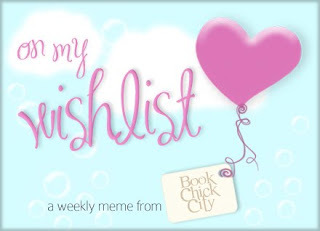 This is a weekly meme hosted by Book Chick City, where we list the books we really, really want, but haven't bought yet. The books can be old, new and/or forthcoming.
" Starred Review. It's a great shame that Fraser (1957–2008) didn't live to see the publication of this impressive dark fantasy debut, which introduces a stirring classic vampire. Baron Gideon Redoak is the gay son of a Puritan living in 1641 Shrewsbury, England. At age 19, he's seduced, turned and abused by Etienne Corbeau, a sadistic vampire who eventually buries him alive (or undead). Evan Jones, a Welshman with superhuman abilities, digs Gideon up at the behest of Le Societé des Gardiens, vampires who don't believe in killing. Over the next several centuries, Gideon learns much of love and grief as he and Evan join a group of druids in battling the evil vampires. Fraser keeps the pages turning with brisk pacing and a thoughtful, sensitive portrayal of Gideon's struggles with Corbeau and his inner puritanical demons." I love a good vampire - story, and the description of this one really got my attention.
" Alexia Tarabotti is laboring under a great many social tribulations. First, she has no soul. Second, she's a spinster whose father is both Italian and dead. Third, she was rudely attacked by a vampire, breaking all standards of social etiquette. Where to go from there? From bad to worse apparently, for Alexia accidentally kills the vampire - and then the appalling Lord Maccon (loud, messy, gorgeous, and werewolf) is sent by Queen Victoria to investigate. With unexpected vampires appearing and expected vampires disappearing, everyone seems to believe Alexia responsible. Can she figure out what is actually happening to London's high society? Or will her soulless ability to negate supernatural powers prove useful or just plain embarrassing? Finally, who is the real enemy, and do they have treacle tart? SOULLESS is a comedy of manners set in Victorian London: full of werewolves, vampires, dirigibles, and tea-drinking." Again, a story about vampires. This one is also set in Victorian London, one of my favorite time periods to read about. I have heard a lot of great things about this series.
" I met someone who changed everything. Matthias. My autistic sister's guardian angel. Honest. Inspiring. Funny. Hot. And immortal. That was the problem. What could I do? I did what any other girl would do-I fell in love with him. Zoe's sister darts in front of cars. Her brother's a pothead. Her parents are so overwhelmed; they don't see Zoe lost in her broken life. Zoe escapes the only way she knows how: partying. Matthias, a guardian sent from Heaven, watches over Zoe's autistic sister. After Zoe is convinced he's legit, angel and lost girl come together in a love that changes destiny. But Heaven on Earth can't last forever." This one went straight to my WishList when I read this amazing review. What's on your wishlist this saturday? Vamps by Fraser and Angels by Laurens look great and everyone knows about Carriger's book. Hope you get them all! I'd forgotten all about Soulless. I've been wanting to read that for ages. I hope you get to read it and the other books on your list soon. Hope you get your books. Here's what I'm wishing for this week.